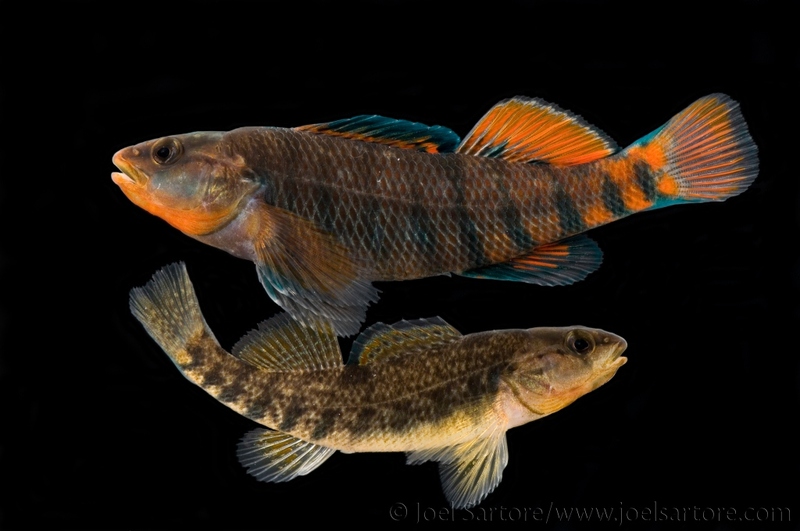 Etheostoma caeruleum Storer, 1845, Fox River, Illinois, United States. No subspecies are recognized. Maximum total length 3 in (7.7 cm). 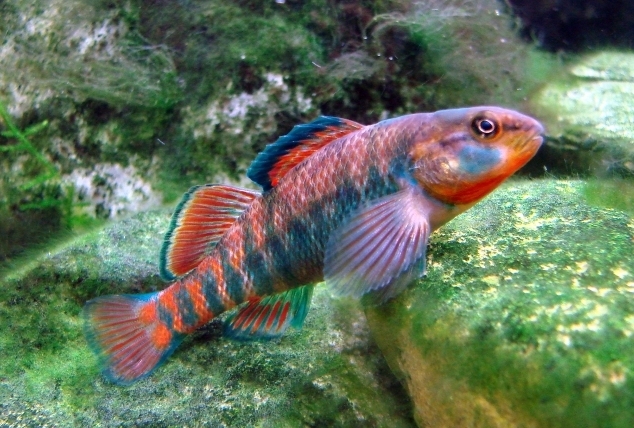 Brownish orange fish with about a dozen vertical, green bands on the sides of its body and green markings on its face. It has two dorsal fins. Eastern North America from southern Ontario, Canada to Mississippi and Louisiana, and from Minnesota to West Virginia in the United States. 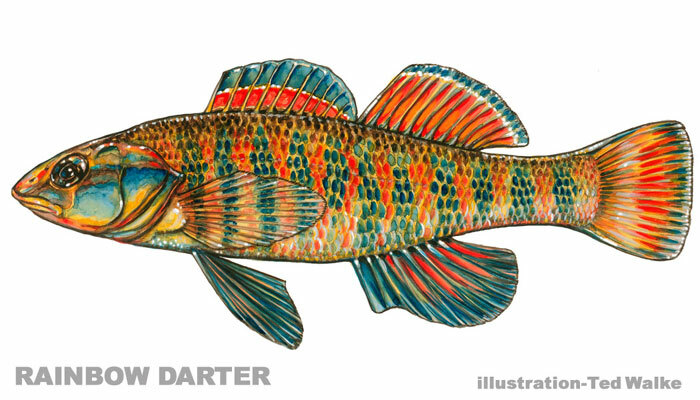 Bottom-dwelling, freshwater fishes that inhabit the swift currents of creeks, as well as average-to-small rivers. Solitary, stations in the lee of rocks as it moves over the bottom in search of food. Individuals are very wary and seek shelter among rocks at the slightest disturbance. Feeds primarily on crustaceans and invertebrates, but also eats fish eggs and larvae. Feeding can involve suction, in which they draw water and prey into their mouths, or diving head-first toward sandy and gravely substrate after prey. Males become more brightly colored during breeding season, which occurs in the spring. Females wait in slower waters of a stream, half-buried in the substrate, while males enter stream riffles. As a female approaches the spawning site, a male swims up, following her closely and defending her from any other interested males. He continues to maintain this “moving territory” until mating occurs. During mating, males align themselves next to the female and spawn while both vibrate. Females typically lay three to seven eggs at a time, but spawn multiple times, sometimes laying up to 1,000 eggs per season. Females typically bury their eggs, which hatch in 10–12 days. They reach sexual maturity at one year.